I (the Big Sister) want to know about the books, poetry, and even magazines, that you are reading right now and I'll share what I'm reading too! This is a place at the Books for Walls Project where you can come to post if you are reading something really good and want the world to know --or, I suppose, if you are reading something really bad, too. Thanks, we need a new book to read aloud, so we are looking forward learning what you are reading! If you aren't reading anything, right now, take another challenge. And the Mom says to check out all the great comments on The Bedtime Story Challenge! The book that I can't put down is The Giver by Lois Lowry. The story is about a boy living in a society where a few people decide everything for everyone and only one person holds all of the memories of the past. Some days after chasing down work, balancing kids and home I think having all my choices made for me sounds almost nice --but I wouldn't trade my free will for that existence. Its good to escape into the story for a while --to unwind. Big Sister started reading this to me last night and I read a little to myself --its about a mouse that travels around the world and doesn't like it when his cousins, Thea and Trapp are PUSHY and Geronimo has to do what they say. Its funny but some of the covers are freaky --there is this one picture that has a castle sitting on a skeleton's head and one eye had a fountain in it (its freaky, but cool.) Geronimo is a huge series, lots and lots of books and they are thumbs up! A 14 year old girl in Old England is trying to hide from her two older brothers, Sherlock and Mycroft Holmes, because she wants to act like a boy --but her brothers want to send her off to boarding school to become a lady. Enola is in disguise and on and adventure! I have only read four chapters but, so far the book is great. The Girl Who Chased the Moon, by Sarah Addison Allen. I read this in less than 24 hours. An eight foot tall grandfather, mystical men, magical baking women, and love love love, mmmm. The book opens with a dedication to Robert Pershing Wadlow, the worlds tallest man --and closes with "A Year of Full Moons." The Dreamer by Pam Munoz Ryan drawings by Peter Sis. I just got started --love the illustrations and that the main character Neftali, is Pablo Neruda as a boy. I will let you know how it goes. I am reading my way through all sorts of Young Adult Literature. Runemarks by Joanne Harris (author of Chocolat) Another Young Adult book, only on page ten. Read it after reading Idzie's post about it. So far, so good... I am a little daunted by the 526 pages! Rolling Stone Issue #1104. Robert Downey Jr cover story, very enlightening and entertaining. Coop: A Year of Poultry, Pigs and Parenting by Michael Perry. Yes, I may be biased, for I fell in love with Perry's writing style, sense of humor, and poetics early on, but this book has nuggets of fun for all types of folks--particularly a number of my friends who've recently decided to take on 4H pigs or city chickens. Not just about small farm life, it too offers insight into life, death, friendship, parenting, relationships, freelance work, gardening, midwifery, etc. I am thoroughly enjoying each scrumptious nibble! Perry’s want to do his part is reminiscent of so many recent conversations & contemplations, including this fabulous article in the Times last week… http://www.nytimes.com/2010/03/14/magazine/14fob-wwln-t.html. The Drama of the Gifted Child by Alice Miller. This tiny little text has done more to illuminate the impact of being alive than almost any other that I’ve delved into. The denseness of the subject matter is treated with an amazingly insightful eye. Miller is phenomenal. The Sun, Magazine, May 2010 issue. So far, I have partaken of two pieces that have satiated… a piece by SPARROW called “Eat Your Dreams” which encourages us to delve into and relate to our dream life. The other sweet-treat was “Countertop Culture: Something is Fermenting In Sandor Katz’s Kitchen” by Liz Crain. This recurrent theme of learning and doing our part to lessen the strain of consumerism on Mother Earth rises to the surface again and again. The Book of Qualities by J. Ruth Gendler. I keep this treasure near to me always. A gift from a dear friend, Qualities takes every day diction and translates it into an assortment of characters—each with their own idiosyncratic hue, personality, direction, and purpose. No other text has given such enlightened pleasure. I do not merely reach for it to be inspired, or remember on a ‘bad day’, but to be further imbued with my hope/wonder/awe on the best of days. I'm currently reading "Hold on to your Kids" by Gordon Neufeld; Buddhism for Mothers by Sarah Napthali; Three Cups of Tea by Greg Mortenson; Mothering Magazine: May-June Issue; and I'm also reading/editing an unpublished book . . . that doesn't yet have a title. . . ! I am also re-starting One Hundred Years of Solitute by Gabriel Garcia Marquez. I started it a couple years ago and put it down for some reason never to pick it back up again. I think I am more ready for an epic odyssey full of magic and humanity this summer than I was then. I highly recommend Marquez's book Love in the Time of Cholera - a good one to take to the beach. My daughter is reading more of The Littles series by John Peterson aloud during our family story time. 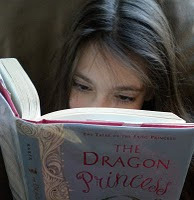 She has blossomed into a voracious reader who quietly turns her light back on to keep reading after I say good night! THANK YOU to Big sister, for this terrific challenge. This gives us a place that we can jump on to over and over again without being concerned about whether or not it fits the category. THANK YOU to Dreamer Jenn. I was intrigued by your comments on The Book of Qualities so I got online at Barnes and Noble, found a store near me that had it in stock, reserved it, then ran out to pick it up. When I got home I started to gulp it down, but it's much too good for that. So I'll savor it slowly in between "what I'm reading now." Well, not right now, because I must get back to house clearing. I'm re-reading it, but I haven't started yet. I reminded myself of it when I took the Shakespeare challenge so, when I finished the book I was reading, I took from the shelf "A Norton Critical Edition" which I had bought a while ago to replace the third copy of the novel which over the years had been borrowed and never returned. What I discovered in the back of this edition was letters and essays and manuscript comparisons and background information - and I'm absorbed in them. (It's sort of like when you hear from someone in the Netherlands and so you find out all about the Netherlands.) I have always named Faulkner as my favorite writer, and this as number one on my favorite novels list. What an amazing new/old experience! Atop my "gotta finish reading these" pile is Frederick Buechner's "Secrets in the Dark", a collection of his sermons. Don't let the word "sermons" scare you. Here's a typical closing line in one of these inspired and inspiring essays: "The kingdom of God is the eyes of love and longing and blessing that we raise to look at him as though he is a rainbow in the sky." This guy writes of a God we can live with, and may want to. Just finished "Door Number Three" by Patrick O'Leary. Oddball Sci-Fi book my dad gave me, by an author from Detroit who is also one of my dad's friends. Strange and thought-provoking story involving time travel, aliens, and psyhcotherapy set primarily in Detroit. Good story on its own, particulary fun for me were the Detroit references throughout- Henry Ford Hospital, Pistons, Hart Plaza, and even a trip to nearby Point Pelee in Canada. I'm currently reading a novel called A Song For Arbonne by Guy Gavriel Kay. A book about Gretchen Rubin dedicating a year to studying, testing, and changing her life to seeking the most happiness, possible, out of it! We just had to share! The sound recording of the Newberry Award winning book Pia just mentioned is read by none other than our Antarctica connection: Marika!! Performers: Read by Marika Mashburn. Pretty Cool, Huh? We have the local Traverse City copy on hold, so we can hear her voice! Kirk just started a book called A Handmade Life: In Search of Simplicity by Wm. S. Coperthwaite last night (given to us by Jayne!). He isn't home right now so we can't ask his opinion. Right now, I'm reading several books, but Echo in the Bone by Diana Gabaldon is on top of The Princess and the Goblin by George MacDonald. All the others are about meditation, families and creative adventures! im reading a gem of a book called "you cant get there from here~ A year on the fringes of a shrinking world" by Gayle Forman. It is about a woman who endeavors to embrace endearing eccentrics.I knew I would love this book when I came upon this paragraph in the middle of her "invitation to a shrinking world"
"it's no accident that my global education came not from economists, politicians, or professional opinion makers but from Tolkienists and transvestites. You see, I am a member of the Tribe of Odd. Have been, since, as a little girl I came to realize I was not like an Amy or a Jenny. I was a weird girl." I am in the midst of reading Another Country by Mary Pipher (Reviving Ophelia). Last Christmas, my daughter gave copies of the book to each member of our family. The book written by a clinical psychologist deals with the best and the worst ways of inter-generational passage through case studies, cultural and time-period differences, and amazing images. I cried at the pathos and was uplifted by the rich goodness. The stories point to a need for new ways of sharing our time, energy, and love. Within its pages rests a hope for the “old” to become “elders”. by Anthony de Mello, S.J. subtitled "A Spirituality Conference in His Own Words." It is a wonderful reminder of so many ways to be kind in our world, with the choices we face every day. I love looking around on your site! Hope all is well for your family! I just finished Necromancer by Michael scott, as always I felt like i was cut short, soooo good and so loong to wait for the next one. I'm reading the weed that strings the hangmans bag by Alan bradley. well technically i am but im also reading the curse of the pharaohs by elizabeth peters which are both really good and i loved sweetness at the bottom of the pie which is the first book by alan bradley. Because I heard a couple of lines from one of his poems echoing in my head, I took down a volume of The Complete Poems and Plays of T.S. Eliot (This is really not an accurate title because this particular book was published while he was still alive and writing.) to find those lines. I'm not ready to return the book to the shelf. I am savoring the offerings and discovering things I missed or did not grasp or appreciate when I was younger. So it is with great books, n'est pas? Thanks to The Teacher's mention of T.S. Elliot I am reading Four Quartets tonight. I am about halfway through and seem to have stalled. Thankfully I accidentally reserved a copy of the reader's guide --I will give it two more chapters before giving up. It began so perfectly, but stalled --for me-- about around chapter 5. After our experience with her in April I decided I needed to learn more about her --very, very interesting woman. A friend suggested it, lots of information, compelling research, but it makes me sleepy I will try two more chapters tonight. Gaia Girls, Enter the Earth by Lee Welles aloud to the girls at bedtime, which is now... time to read! Among other books --which I will list soon on my Bedside Booklist-- I am reading the latest from Allende. 1/2 way through I am entertained and educated and MUST finish it soon, because it is due back at the library! I'm back here because of C.S. Lewis's comment about reading old books. I've been feeling out-of-it lately as I read your comments about all the new books you are reading while I'm into re-reading. I'm currently 7/8ths of the way through Dostoievsky's The Brothers Karamazov, which I first and last read over 40 years ago. Now I don't have to feel embarrassed that I don't have a "new find" to contribute. I'm happy to report that I made it all the way through The Brothers Karamazov. (There were times when I wanted to give up.) And now, forsooth, I am reading the Merry Adventures of Robin Hood by Howard Pyle. And I'm delighting in the language as much as the familiar excursions into Sherwood Forest! I found this book after listening to Heidi's segment on NPR about Literary Destinations. As a white girl that grew up in a predominately African American neighborhood in Detroit during 70's and 80's -this book is haunting, her imagery and the voices of her characters are part of my past. I had nightmares about the story, but couldn't wait to begin reading it again today.